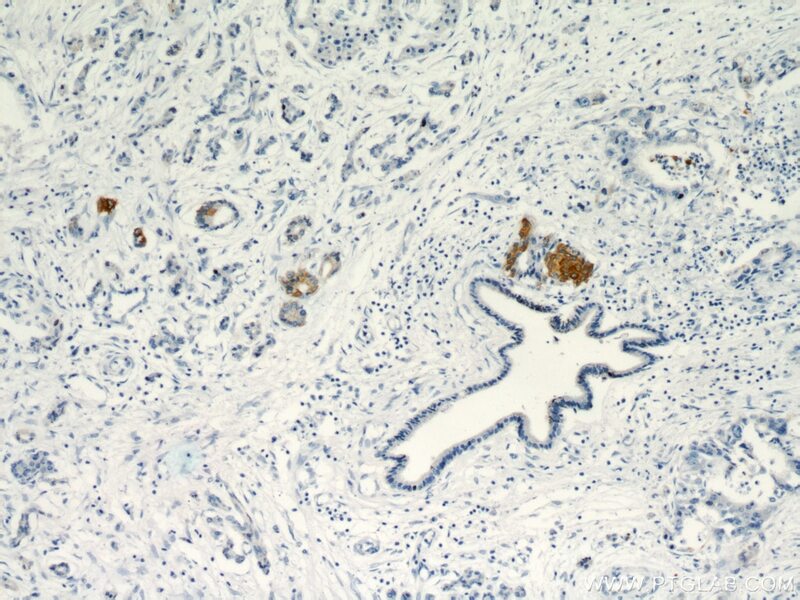 Immunohistochemical analysis of paraffin-embedded human cervical cancer tissue slide using 18502-1-AP( Cytokeratin 17 antibody at dilution of 1:200 (under 10x lens). 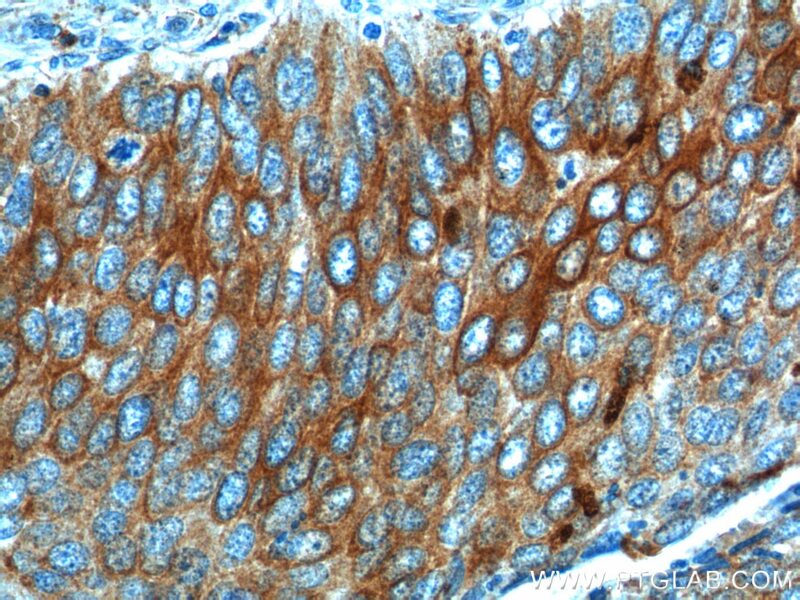 Immunohistochemical analysis of paraffin-embedded human cervical cancer tissue slide using 18502-1-AP( Cytokeratin 17 antibody at dilution of 1:200 (under 40x lens). 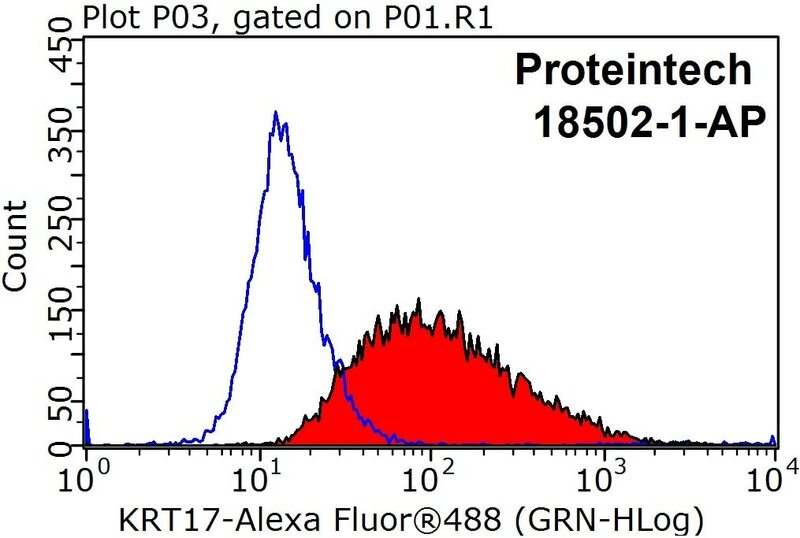 IP Result of anti-Cytokeratin 17 (IP:18502-1-AP, 4ug; Detection:18502-1-AP 1:600) with HeLa cells lysate 1600ug. 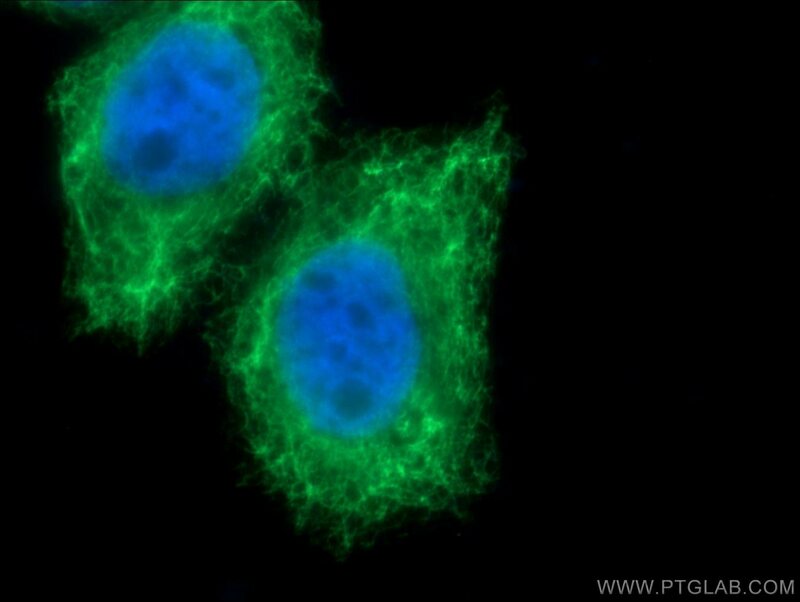 1X10^6 HeLa cells were stained with 0.2ug Cytokeratin 17 antibody (18502-1-AP, red) and control antibody (blue). Fixed with 90% MeOH blocked with 3% BSA (30 min). Alexa Fluor 488-conjugated AffiniPure Goat Anti-Rabbit IgG(H+L) with dilution 1:1000. Keratins are a large family of proteins that form the intermediate filaments that make up the cytoskeleton. 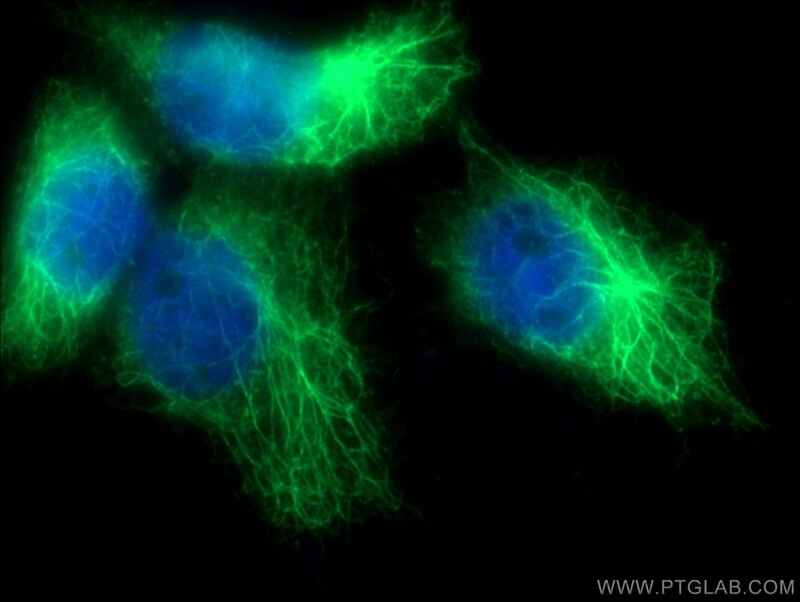 Type I keratins are a group of acidic intermediate filament proteins and type II keratins are the basic or neutral counterparts. 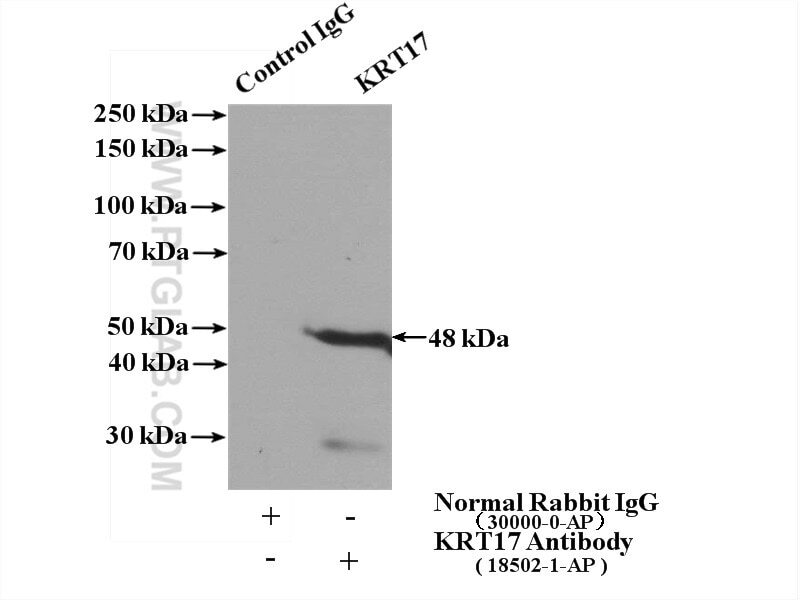 Keratin 17 is encoded by the KRT17 gene and is a type I cytokeratin found in nail beds, hair follicles, sebaceous glands, and epidermal appendages. What is the molecular weight of cytokeratin 17? The molecular weight of cytokeratin 17 is approximately 49 kDa. What is the function of cytokeratin 17? Cytokeratin 17 plays a role in the formation and maintenance of epidermal appendages, especially in determining the shape and orientation of hair. It is required for the maintenance of the anagen (growth) state of hair follicles by modulating the function of TNF-alpha for hair cycling and is also involved in tissue repair (PMID: 16702408). What is the cellular localization of cytokeratin 17? Cytokeratin 17 expression is located in the cytoplasm. What is the tissue specificity of cytokeratin 17? 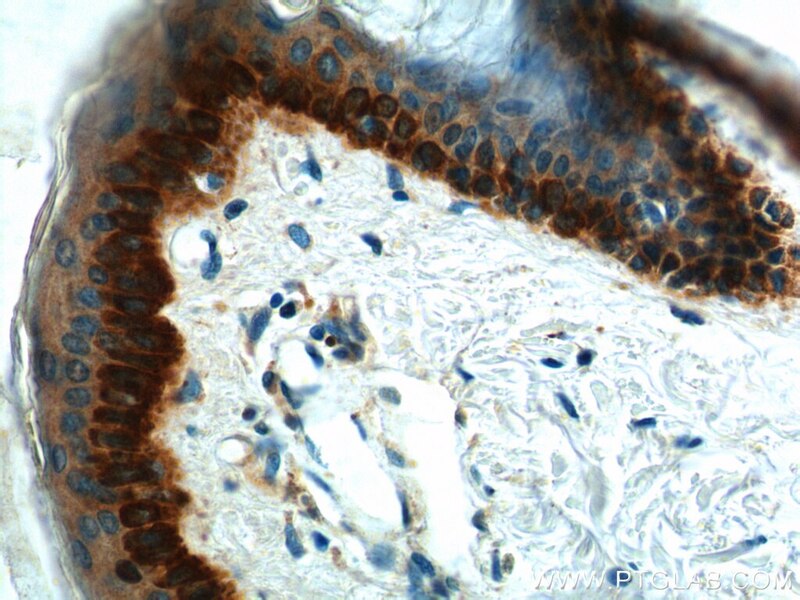 Cytokeratin 17 expression is found in the outer root sheath and medulla regions of the hair follicle, particularly in the eyebrow, beard, nail bed epithelium, basal cells of the oral epithelium, and sweat and mammary glands (PMID: 2451629). Expression can also be found in epithelial layers of the prostate and urinary bladder and cambial cells of the sebaceous gland at the protein level. What is the role of cytokeratin 17 in disease? Mutations in the KRT17 gene are a cause of Jackson-Lawler type pachyonychia congenita type 2 (PC2); an autosomal dominant ectodermal dysplasia characterized by hypertrophic nail dystrophy (PMID: 7539673). Defects in KRT17 also lead to steatocystoma multiplex (SM) (PMID: 9767294). 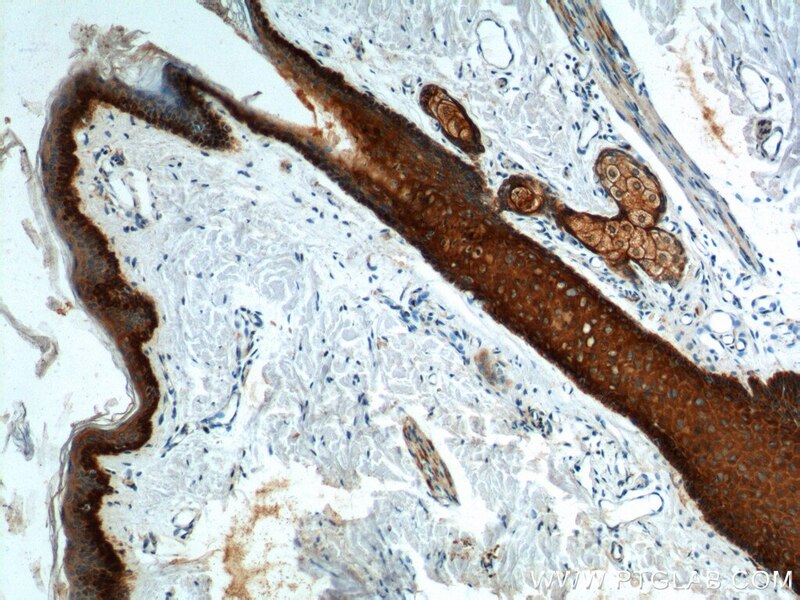 Cytokeratin 17 acts as an autoantigen in the immunopathogenesis of psoriasis (PMID: 23722817). 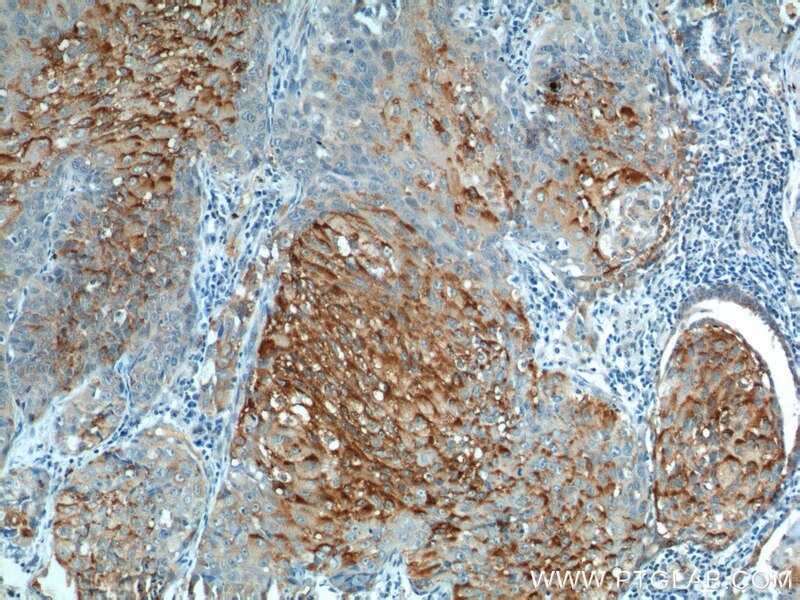 Immunohistochemical analysis of paraffin-embedded human lung cancer tissue slide using 18502-1-AP( Cytokeratin 17 antibody at dilution of 1:200 (under 10x lens). 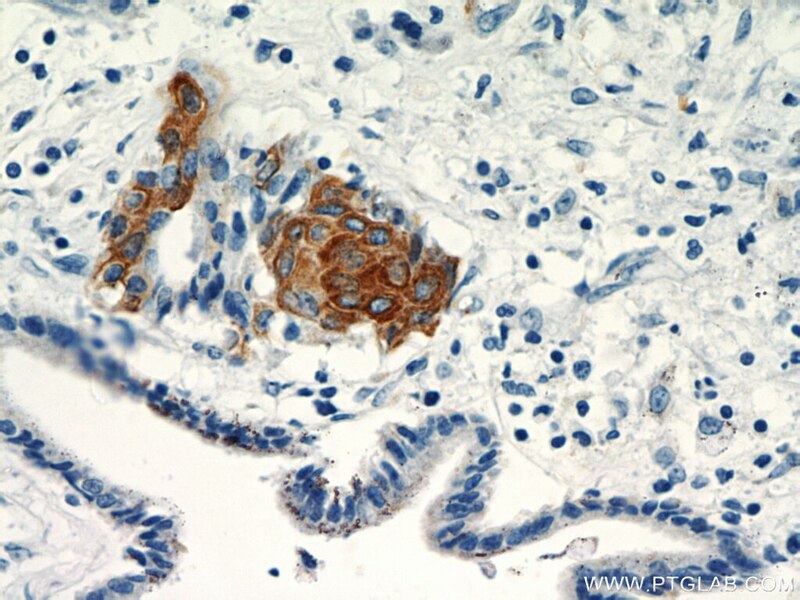 Immunohistochemical analysis of paraffin-embedded human lung cancer tissue slide using 18502-1-AP( Cytokeratin 17 antibody at dilution of 1:200 (under 40x lens). 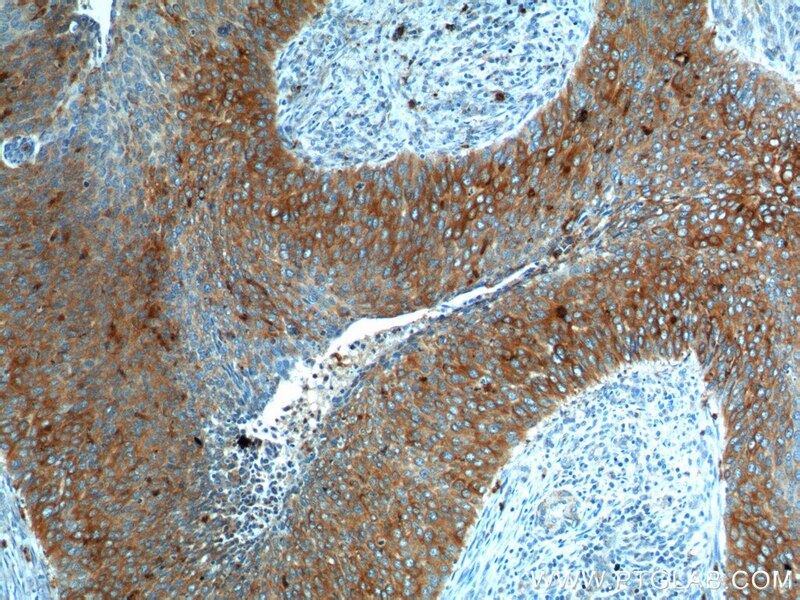 Immunohistochemical analysis of paraffin-embedded human skin tissue slide using 18502-1-AP( Cytokeratin 17 antibody at dilution of 1:200 (under 10x lens). 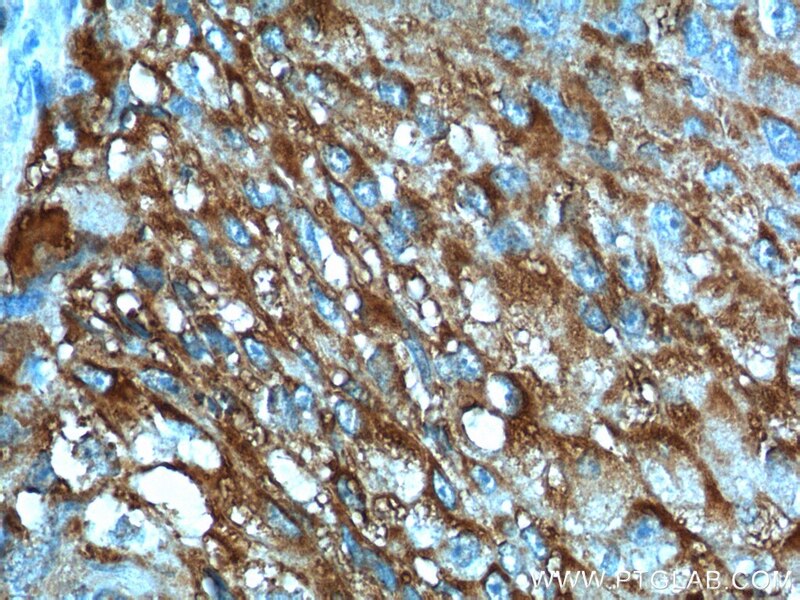 Immunohistochemical analysis of paraffin-embedded human skin tissue slide using 18502-1-AP( Cytokeratin 17 antibody at dilution of 1:200 (under 40x lens).